Can "event films" popularize fine art the way high-definition simulcasts have done for opera? Phil Grabsky, an award-winning British filmmaker, has staked money on it. His "Manet: Portraying Life," set to make its debut next Thursday on about 1,000 movie screens in 28 countries, takes viewers to the Royal Academy in London. The film begins outside on a cold night in January, where Tim Marlow, an art historian, introduces Édouard Manet (1832–1883) as "the man considered by many to be the father of modern art." 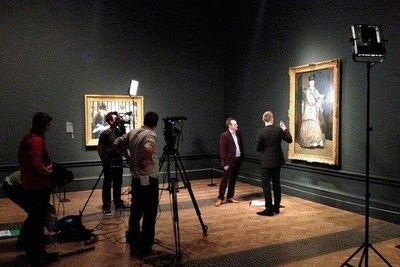 Then, the camera pans around the galleries, which are soon to fill with the opening night crowd, and the film weaves together the behind-the-scenes drama of how the exhibition came together, close-up examinations of key paintings, interviews with experts, and recreated moments in the artist's life. The 90-minute movie is the first in a series Mr. Grabsky is making to capture blockbuster exhibitions that most people will never see in person. In association with BY Experience, a Brooklyn-based producer and distributor of digital films to independent theaters, and NCM Fathom Events, which distributes performances by the Metropolitan Opera and Britain's National Theatre to cinemas around the world, he has started Exhibition: Great Art on Screen. After "Manet" will come "Munch 150." Set for a June release, the film will chronicle a landmark exhibit in Oslo on the 150th anniversary of Edvard Munch's birth. In October, "Vermeer and Music: The Art of Love and Leisure" will cover an exhibition at the National Gallery in London. The idea for these films came to Mr. Grabsky in 2012, with the success of his "Leonardo Live," a 100-minute film that took the National Gallery's "Leonardo da Vinci: Painter at the Court of Milan" to viewers around the world. In Britain, the production, which coupled pre-filmed elements with live interviews at the evening opening, was simulcast to 41 theaters, which Mr. Grabsky said were 98% sold out even though it was shown on TV at the same time. "The next day I began talking with the galleries of the world," he said. Mr. Grabsky comes to the task with the zeal of an evangelist. He's been making documentaries for almost 30 years, with the last 15 focused largely on the arts, including a series on great composers and "Making 'War Horse,'" which described how a children's novel became a smash hit at Britain's National Theatre. The sold-out Leonardo exhibition—with nine of his 15 surviving paintings brought together for the first, and probably last, time—begged for wider exposure. Mr. Grabsky was hired and charged with producing a live show. That didn't always work; critics thought the quick cuts between the film's two "presenters" were jarring and that some live interviews were pedestrian, even silly. Mr. Grabsky says he doesn't disagree with much of the criticism: "'Manet' is much better because of the debate we had about 'Leonardo Live.'" The Exhibition productions still face inherent problems. Mr. Grabsky can't simply turn digital cameras on an art exhibition the way operas are filmed, unmediated. He has to create a story arc, and has chosen to deploy Mr. Marlow as the narrator, tour guide and interviewer. As a result, only portions of "Manet: Portraying Life" are analogous to seeing the exhibition—though sometimes the film offers more: Mr. Grabsky often holds the camera on a painting, full screen, for as long as 30 seconds. That's much longer than most people spend with a painting at an exhibit. Both Ms. Borchard-Young and a spokesman for Emerging Pictures, which distributes films of performances at Milan's La Scala Opera and other European performing arts companies, say that the market for these films has plenty of room to grow. "People over 40 are often alienated from film," said Ms. Borchard-Young. "That's the audience we speak to." But it took time for the Met to build those audiences, and at least one museum is also venturing into this territory, on its own: In June, the British Museum will release its self-produced "Pompeii Live From the British Museum" about its "Life and Death in Pompeii and Herculaneum" exhibition, which opened on March 28. Mr. Grabsky is lining up museums for five films a year, looking for the best exhibitions: "If that means going to Sydney or Los Angeles or Tokyo, that's where we'll go."